If you have been searching for a sleek family vehicle that is packed with cutting-edge features, then it might be time to take a closer look at the 2018 Grand Caravan. 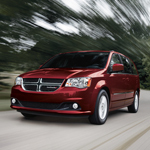 The engineers over at Dodge designed this popular minivan with comfort and utility in mind. Loading up your new Grand Caravan isn’t going to be a problem with the power liftgate and sliding doors. You can remotely open the doors and turn on the vehicle before you step outside of your home. Once you get behind the wheel, the vibrant halogen headlamp will light the road ahead of you and help you avoid obstacles. The team here at Lochmandy Motors would love to show you all of the amazing features found on the 2018 Dodge Grand Caravan. Feel free to call our Elkhart location today to schedule a test drive.